Featuring a clean and modern profile, this large rectangular wall mirror features a generous beveled edge set on all four sides. Small, delicate silver leaf details accent each corner of this beautiful large wall mirror. The beveled edges on each side add a lovely finished and complete look. 26" wide x 34" high x 1 1/2" deep. Hang weight is 18 lbs. Glass only section is 20" wide x 28" high x 1/4" deep. Surrounding frame is 3 1/2" wide. 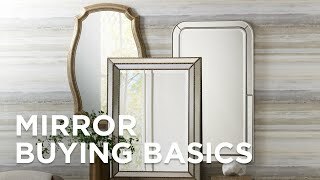 Large rectangular wall mirror from Uttermost. Antiqued silver leaf finish. Fir wood and MDF frame construction. Beveled glass edges.